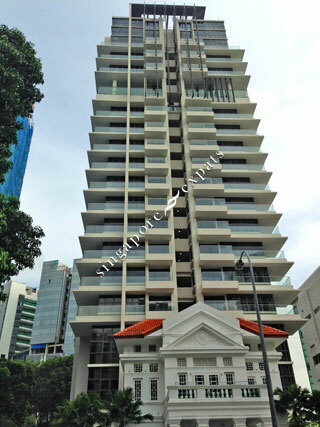 THE ARISTO @ AMBER is located at 23 AMBER ROAD in district 15 (Katong, Siglap, Tanjong Rhu) of Singapore. THE ARISTO @ AMBER is a Freehold Condo development consisting of 56 units. THE ARISTO @ AMBER is completed / TOP in 2013 (estimated), developed by AG CAPITAL PTE LTD.
Educational institutions like CHATSWORTH INTERNATIONAL SCHOOL (EAST), CANADIAN INTERNATIONAL SCHOOL (TANJONG KATONG), ETONHOUSE INTERNATIONAL SCHOOL, TANJONG KATONG PRIMARY SCHOOL, TAO NAN SCHOOL and CHIJ (KATONG) PRIMARY are near to THE ARISTO @ AMBER. THE ARISTO @ AMBER is accessible via nearby DAKOTA, MOUNTBATTEN and PAYA LEBAR MRT Stations. Aristo at Amber feels like a Mini Raffles hotel with its facade and also offers unblocked panoramic seaviews for units above level 10. It is very near to an underground walkway that leads to the famous East Coast Park where we can enjoy all outdoor sports and dine at the cool cafes and restaurants facing the sea. Best part is that it is also within walking distance to the biggest mall in East Coast known as Parkway Parade .There is a hawker centre for local food and wet market beside this mall too so Aristo's location really covers everything we need for a healthy,enjoyable and convenient home away from the city stress. True Resort Living with Panoramic seaview and walking distance to all shopping malls . Best are the underground tunnels that lead to Singapore's most famous beach East Coast Park for all outdoor sports and indulgence at the numerous dining options by the sea. This building is relatively new and conveniently located by the roundable at Marina Parade Road - of walking distance to Katong Shopping Centre. Limited facilities compensated by being next door to the Chinese Swimming Club (has its own sports complex offering tennis, squash, badminton courts, bowling alleys, snooker tables, banquet facilities and dining spots). Underpass to East Coast Park!